The aim of this study was to specify the effects of caffeine on maximal anaerobic power (Wmax). A group of 14 subjects ingested caffeine (250 mg) or placebo in random double-blind order. TheWmax was determined using a force-velocity exercise test. In addition, we measured blood lactate concentration for each load at the end of pedalling and after 5 min of recovery. We observed that caffeine increasedWmax [964 (SEM 65.77) W with caffeine vs 903.7 (SEM 52.62) W with placebo;P<0.02] and blood lactate concentration both at the end of pedalling [8.36 (SEM 0.95) mmol · l−1 with caffeine vs 7.17 (SEM 0.53) mmol · l−1 with placebo;P<0.011 and after 5 min of recovery [10.23 (SEM 0.97) mmol · l−1 with caffeine vs 8.35 (SEM 0.66) mmol · l−1 with placebo;P<0.04]. 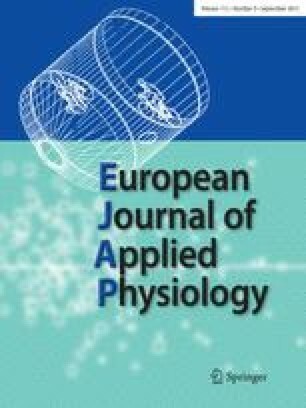 The quotient lactate concentration/power (mmol · l−1 · W−1) also increased with caffeine at the end of pedalling [7.6 · 10−3 (SEM 3.82 · 10−5) vs 6.85 · 10−3 (SEM 3.01 · 10−5);P<0.01] and after 5 min of recovery [9.82·10−3 (SEM 4.28 · 10−5) vs 8.84 · 10−3 (SEM 3.58 · 10−5);P<0.02]. We concluded that caffeine increased bothWmax and blood lactate concentration.